Grant Sparks and Mitchell Mullins at WRFL. Photo by Matt Barton. LEXINGTON, Ky. (March 2, 2018) — For 30 years, a small studio staffed by talented University of Kentucky students has filled the Lexington airwaves with unique tunes not often heard elsewhere. 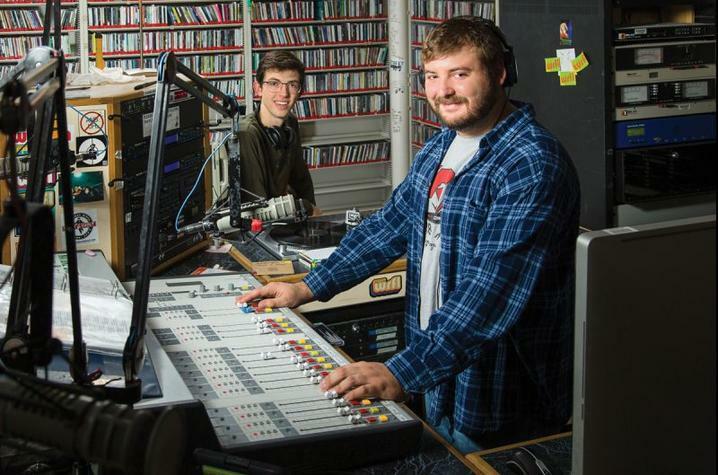 WRFL, UK's student-run radio station and a mainstay on campus and in the local arts scene, is celebrating the big 3-0 this month doing what it does best — bringing people together with music. "The station is without a doubt in the top 10 college radio stations in the U.S.," said Kakie Urch, associate professor in the College of Communication's School of Journalism and Media. As a student at UK, Urch helped establish the free, alternative radio station in 1988. The station airs 24/7 and its coverage area includes Georgetown, Frankfort, Versailles and Stamping Ground, as well as Lexington and online at http://WRFL.FM. A wide range of artists and bands are featured on WRFL, but they all have one thing in common — they live outside Top 40 radio and expose listeners to underground and local music. WRFL's real charm lies in how its operated though, and who's in the DJ chair. Since it began broadcasting, students studying journalism, music, engineering and other fields have manned the DJ chair 24/7, 365. Automation? Never. The students who take on the role of WRFL DJ form a tight-knit community, one that includes hundreds of alumni over the years. From film producers to regional on-air talent and reporters, artists to the current assistant secretary of defense for international security affairs, WRFL alumni have found success across industries and the nation. This weekend, they'll be traveling back to Lexington to celebrate the station, reconnect with fellow RFLiens and meet current students. The 30th Birthday Bash will feature three days of live performances, all with WRFL connections, at the Burl and the Distillery District. Get the full schedule here. Tickets for Friday night's show are sold out, but tickets for Saturday night can be purchased here. During the bash, RFLiens will also tour the current temporary studio and take a peek at what will be its brand-new studio when the UK Student Center opens. Want to hear what it was like at WRFL during the early days? Visit Radio Free Lexington Oral History Project featuring alumni sharing their memories. The collection was digitized by UK Libraries Louie B. Nunn Center for Oral History.